One of the fun things about being a librarian is that sometimes publishers will send us “advance reader’s editions.” These are books that have not yet been published and often times they have not even been reviewed. Usually when we read a book, we’ve already read upteen reviews for it or at least heard about it from Oprah. So it’s very refreshing to pick up a book without having any preconceived ideas about it. Well, okay, in this case Stephen King had written a blurb recommending it, so I did have some idea. And no, it’s not a horror book. It’s called The Story of Edgar Sawtelle, by David Wroblewski. 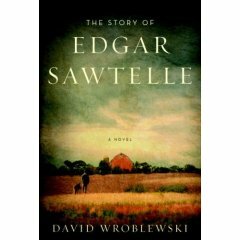 Edgar, born mute and communicating through sign, is a boy growing up on a farm in Wisconsin, a farm on which they raise and train the special (and fictional) Sawtelle breed of dogs. Life is pretty peaceful for the family until his uncle Claude returns and decides to stay. Later, when Edgar’s father dies unexpectedly, Edgar tries to prove that Claude had something to do with it. Unfortunately, his plan backfires, and Edgar is forced to flee into the nearby Chequamegon wilderness. Struggling to survive and provide for the three yearling dogs that accompany him, Edgar grows up quickly. The ending may not be what you hope for or expect, but it is precisely because of it that I predict this book will become excellent fodder for future book discussion groups. Look for it when it comes out!